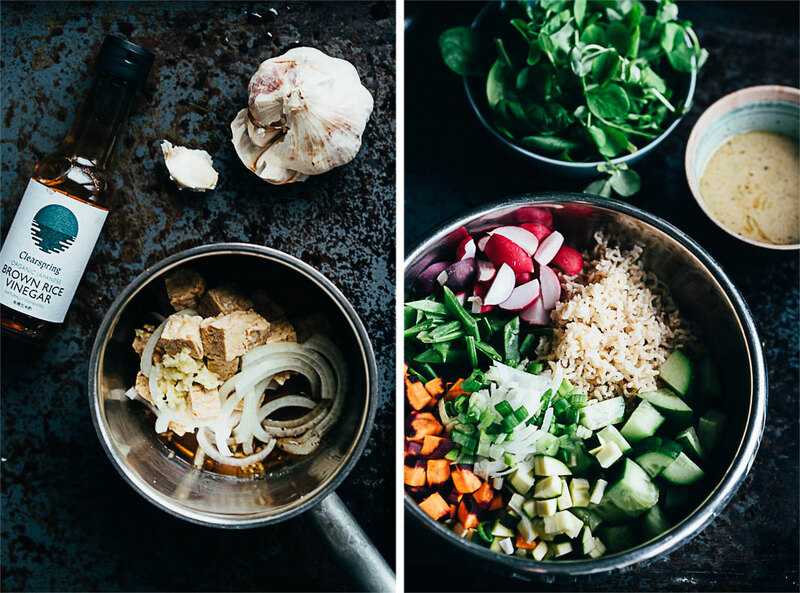 Today I’m sharing a spring appropriate Asian rice bowl with simmered tempeh which contains all my favourite flavours. I was feeling the spring vibrations in London where I made this recipe, unfortunately though I seem to have lost the spring feels here in Sweden because it’s still cold. We’ve seen some rays since we arrived but I think spring is making a much slower entrance to the motherland. We have however seen tussilago in the garden and that is definitely my favourite sign of spring here in Sweden. I love it when the road sides turn yellow with these little flowers. Writing about this makes me curious about what your favourite signs that spring is on its way are? What does spring look like where you are? Tell me. Now, let’s get to talking about the recipe we’re all here to engage with. 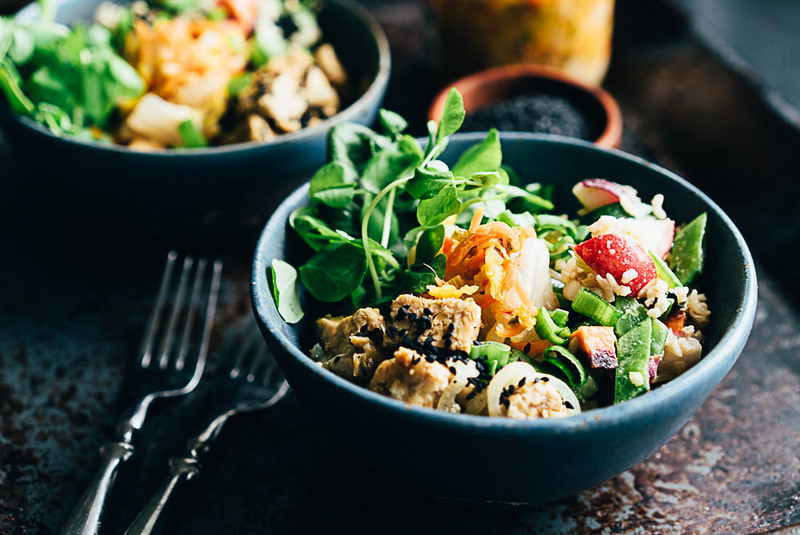 It’s a simple brown rice and fresh vegetable salad dressed in a miso dressing served along with my favourite tempeh dish. I simply combine some flavour enhancers, onion, water and tempeh cubes and simmer away to make a deliciously tender and flavourful tempeh dish. If you’re not into onion you could just leave it out and same with the garlic. You can actually season the mix with anything you like and if you want the tempeh to really soak up the flavours let it sit in the pot for a couple of hours before bringing it to the heat. 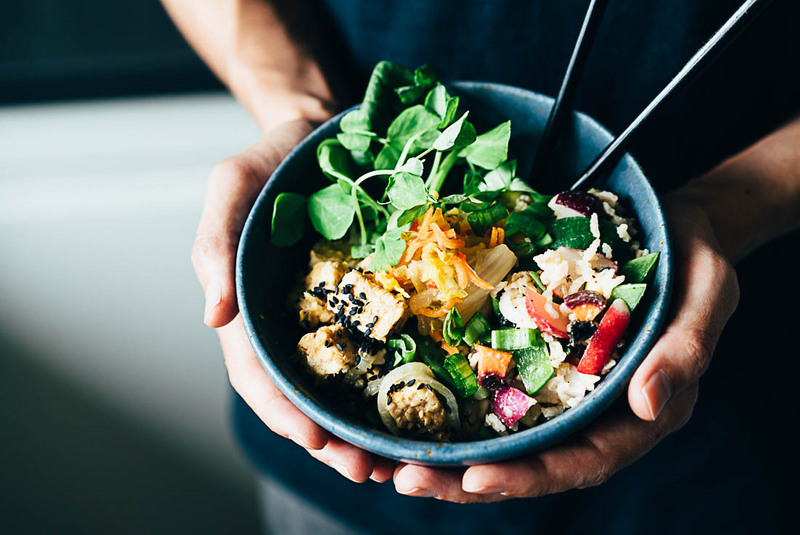 This bowl is the perfect mix of raw and cooked components that I like for spring when I still don’t know whether it’s going to be warm or cold, rainy or sunny. It is also a very colourful dish with a variety of vegetables which adds to the spring feels. The components are all sorts; soft, hard, upward and downward, round, long, flat and I’ve also chosen to cut them into different shapes which I enjoy at this time of year. This dish is versatile in every way. It’s great for a lunch or dinner at the house, works well in a packed lunch and the rice salad component is a great dish to take to the park too or to a spring pot luck. Place all the tempeh ingredients in a small pot, cover with a lid and bring to a boil. Ones boiling turn down the heat and let simmer for 10-15 minutes or until the liquid has been soaked up/evaporated. Either toss the sesame seeds into the tempeh int he pot or sprinkle on top ones served in the bowl. Mix all the wet ingredients for the rice salad in a small bowl or simply shake them in a small jar. 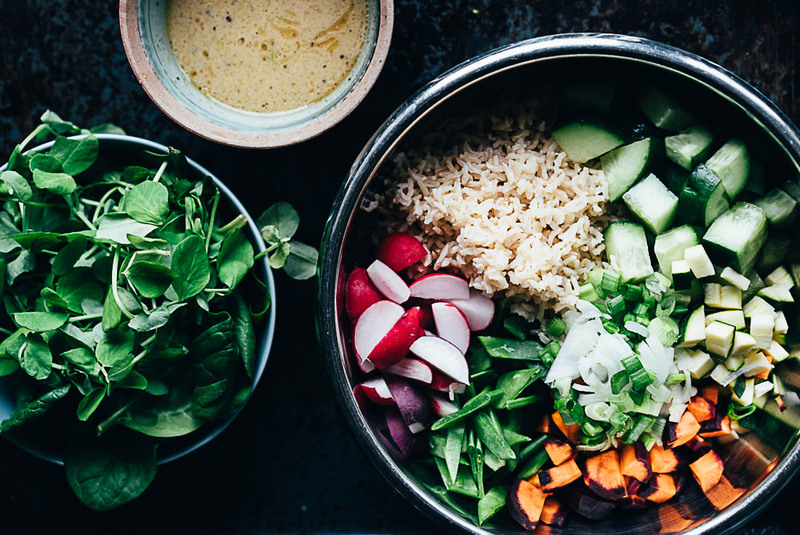 Mix your cooked rice with all your prepared vegetables in a big bowl and pour the dressing over it. Toss to coat the rice salad. 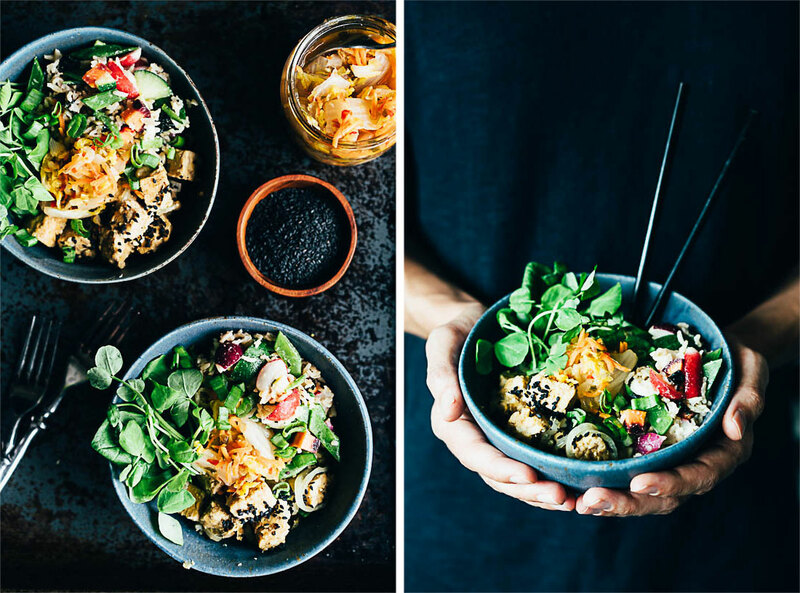 Serve the salad as well as the tempeh with some greens of your choice in a generous bowl along with some fermented vegetables such as kimchi or sauerkraut. This reads snd looks absolutely scrumptious! I’m pinning for making soon. Btw it has gone cold in the UK with a few snow flurries! Now it is sunny but the sun has no warmth. So we ate both waiting for spring to reappear. 🙂 PS I popped over from Instagram. I’m glad you like the look of the recipe, it’s both comforting and uplifting all at ones. Sorry to hear that the nice spring weather I experienced has escaped you, I’ll cross my fingers that it comes back soon for you. And that it arrives here before my feet turn into ice cubes, haha. Hmmm, miso dressing! Can only imagine how tasty that salad must be, and so fitting for spring time! This looks dreamy, and also sounds sooo delicious! It´s been way too long since I had tempeh so I think I´m gonna make a batch soon! For Spring time here it´s mostly that I recognise the birds singing early in the morning again and waking up to the rising sun, which I love! And of course all the plants that are suddenly beginning to bloom (indoors and outdoors!) and that feeling of expanding and upward energy that fills the air… Hmmm, and the first flowers I saw where probably daisies I think! 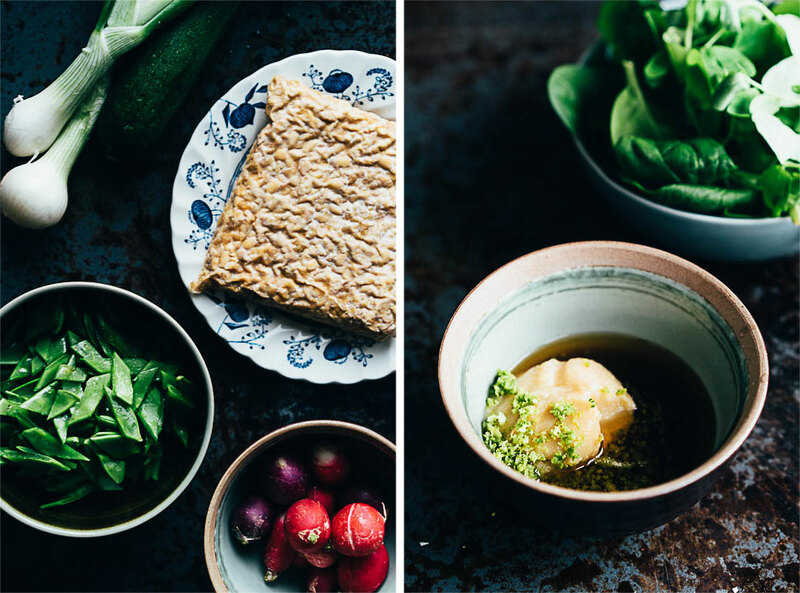 Hope you will have Spring soon in Sweden and thanks for sharing this lovely recipe! Spring in Vienna sounds so good! And yes, tempeh is fantastic. You have to re-experience it. Until then I’ll dream of Serbia!